Skis, that is. It’s been two years since we went skiing. The first year, we had our Fusion passes ready to go, but no snow. Last year, because of my fall with Mocha in the summer, I couldn’t get my injured foot in my ski boot and I lacked confidence in the strength of my ankle. 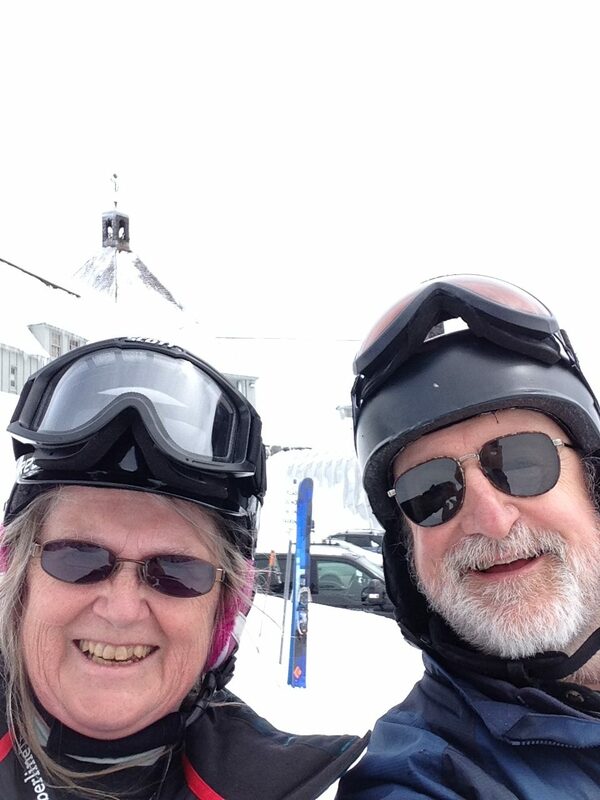 I missed skiing not just at Timberline but at Ferguson Ridge, the little ski area in Wallowa County. This winter was and still is epic snow. Nearly 200 inches at Timberline right now. But I still couldn’t get my feet into those damn boots. So I finally broke down and went to the chiropractor for two sessions of footwork that my massage therapist recommended. After the second session, I shared with the chiropractor that I still couldn’t get my feet into the boots. So I called down to Portland to a boot fitter, and the boot fitter recommended exposing the boots to heat. Given that it was still winter, and the wood stove was burning, I parked the boots by the wood stove. A few hours later–et voila! I could jam my feet into the boots. I followed a further recommendation and yanked the tongues out as far as I could to see if that would also loosen things up. Next, it became a question of when in a busy Portland schedule we could fit skiing in. By this point it was mid-March and the Timberline spring passes were on sale. But I knew from bitter experience that Spring Break at Timberline is total chaos, so…we didn’t go. The stars finally aligned. I had started questioning if I wanted to ski again, but figured well, give it a try. I have a lot of things I’m wanting to do these days and not many of them are in Portland. Still, it seemed to be a good idea to give it a try, especially how epic this winter has been. Plus with the latest cold and wet spell, there’d been a fresh dump of snow in the Cascades. We didn’t race up the hill like we had when cramming skiing in during time off on weekends, or like I did when skiing before work. All the same I had a brief sinking sensation in my stomach as I came down Cherryville, and had to remind myself that I wasn’t going to work, I was just going skiing and having fun. The lot was almost full, which surprised us. It was as slick and icy as ever. Fortunately, several months of life in the snow and ice meant we were a bit more skilled at navigating the parking lot ice rink. Despite the full lot, we were able to get our passes quickly, then go back to boot up and unbag the skis. As I wrenched my snug boots on, I heard the whoosh from the wings of a parking lot raven flying low. I decided that was a good omen because I’ve always enjoyed watching the ravens play at Timberline. It was easier to walk back to the lodge in ski boots instead of my other shoes. I had some trepidation as I stepped into my bindings–woman, are you crazy?! !–but told my inner chicken to shut up and pushed off. It couldn’t be any worse than taking Mocha back out on the roads this spring after a layoff. Lordy, I’d forgotten just how tight those Dalbello Electra boots are. And I gave myself a serious case of thigh burn overcontrolling every turn down the first slope to West Leg Road, and the relief of an easy glide to Stormin’ Norman. The second slope down to Norman was shorter and easier, and I found the whisper of a flow to my movement. We hopped on the chair and rode to the top of Norman. It had changed since the last time we skied there, with a lot of big, big jumps. But the snow was powdery even though there were snowboard divots we had to work through to get to the really good part of the run. I had to stop twice on the first run because my feet were still screaming about those tight boots. But I told myself to ignore it because tight is better than loose. I had a bad fall from packed out liners in soft boots so I’m paranoid about that now. My thighs were also unhappy because–again–I was overcontrolling and not skiing relaxed. Everything clicked on that second run. The boots loosened up and I found myself able to use my feet more effectively. My arms and shoulders rotated from turn to turn as they should. After that first run, my thighs stopped aching so bad and I was able to pick up a little speed. We decided after four runs that this was good for a first day. We both had more in us, but I knew that if something funky happened I was just tired enough to cause me problems. And after all, it was on par for what we’ve done in the past for our first days skiing. So we glided back to the lodge, and I had a wonderful glide down the bottom of the Magic Mile to the lodge. And oh yeah, we did a selfie in front of the lodge. Because we could, and because this really was the first ski of retirement. Two years late, but we finally made it.